*I have not seen his TV series Paranoia Agent, probably to my shame. I want to rectify that in the coming days. How scandalous this movie seemed at the time I heard about it! 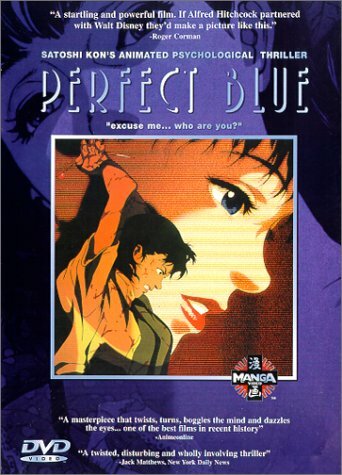 It was sometime in 2000 or 2001; still in college, still rising out of my sheltered, conservative upbringing, Perfect Blue was presented at the time as being a risque, even semi-pornographic thriller which received mixed reviews at best from the mainstream movie critics. I saw it anyway, and discovered the sensational parts were not nearly as much as advertised. But what I discovered was at once disturbing—the image of the crazed otaku obsessed with Mima’s “purity” seems all too prophetic in the wake of recent events—and also immensely clever. Kon’s trademark move, the seamless slide in and out of reality, was already in full force. So was the attention to realism and detail—see the ordinary slice of life scenes during the opening credits sequence—and the social subtext about the way women are objectified in the entertainment industry and how it is so easy to lose oneself in a role. Kon was, in short, almost fully formed from his first film onwards, though he would rely less on “shock” plot elements in future works. Plus, the silly CHAM pop songs stuck in my head for far too long afterwards, as well as the deceptively upbeat ED. It is a movie that lingered in my mind far longer than I thought it would. Kon could have gone in a similar direction to Perfect Blue for his follow-up: directing a clever thriller. 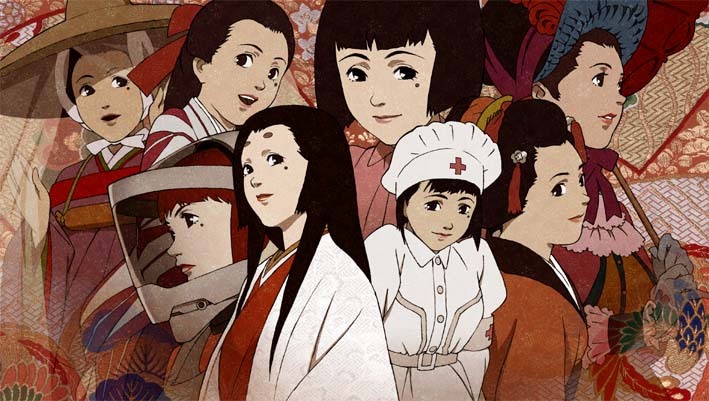 Instead, he chose to explore the inner space of the human memory and heart in Millennium Actress. It was a movie I picked up in a few years later, in a fit of Netflixing, and in some ways it could not be more different from Perfect Blue in tone and subject matter. The similarities are there for someone who wants to look below the surface though. It too is about acting and the playing of a role, except the stage is not just outside with an audience but also within one’s own mind, in the memory. Once again, unlike most anime, Kon uses it to talk about the social changes that Japan underwent in the lifetime of the protagonist, in the roles she played and way a role and a life can become almost one and the same. His stories always exist in a larger context and are not, unlike so many anime stories today, mere self-reference and pandering to a particular niche. 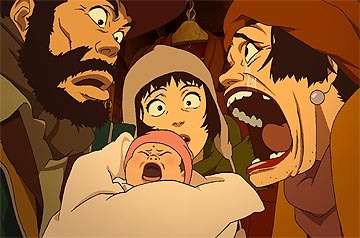 In some ways, Tokyo Godfathers is the most subtle and yet the most joyous film in Kon’s career. Once again, it seems on the surface to be a departure from his previous work: what is the common thread between the past two stories and this Christmas-flavored fable of three bums finding an abandoned infant? The fantasy/reality theme is transmuted once more, this time to the lies people tell each other about themselves, as well as the contrast between a glittering Tokyo and the reality of being homeless on the streets. (For such a warmhearted film, it is surprisingly frank about homelessness; the closest visual and thematic American analogue to this movie, Terry Gilliam’s The Fisher King, romanticizes the indigent much more.) Kon seemed determined to show that he wasn’t simply just a clever/smart director, a Christopher Nolan of anime; he uses Tokyo Godfathers to tell his funniest as well as his most frankly emotional story, one that has more than a few spiritual/parabolic overtures. (Christmas; a child; three people coming upon a child…) This is perhaps the “sleeper” film of Kon’s catalogue, unpretentious and unassuming and yet just as rich and rewarding as any of his work. The dazzling visual bravura and originality of vision in Paprika is well-recognized by critics and fans alike by now. I even wrote about it a few years ago already. This movie, which I saw in the only place it should be seen—a real big screen movie theater—is a canvas where Kon paints his masterwork. It in many ways is the culmination of all the themes he’s worked with in the preceding movies. There is the blurry line between dream and reality, sliding in and out (which Christopher Nolan, bless him, decided to borrow in Inception); there is the image of the Cute Girl flitting in and out of dreams played by no one less than Megumi Hayashibara; there is even the twisted blend of otaku culture and Japanese tradition in that surreal parade. Paprika is a wonder because all of these elements somehow manage to hold together and never lose coherency, even though it nearly overwhelms the senses with its colors and noise. One is dazzled, but never lost. That the story is more inventive than moving is not really an issue; that’s not the point. What Kon did in this film is to showcase the kind of imaginative vision that is only possible in anime, that culturally hybrid medium of East and West we love so much. Paprika in a way is more representative of anime than, say, a Miyazaki or Studio Ghibli movie, which works on its own rules and universe. 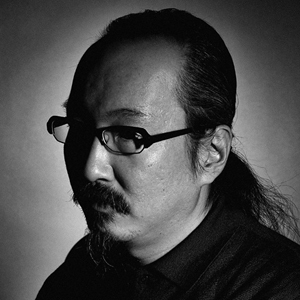 Kon, like his artistic doppelganger Takashi Murakami, uses the elements of anime and otaku culture and transforms it into something uniquely his own. Which is why this movie is really a fitting cap to his career, though untimely and unintended—Kon was working on a film at the time of his death and its fate is uncertain. The essential parts of his artistry are most fully expressed in this movie. If this is to be the last work to bear his name, it is a fine way to go. Kon’s loss hurts not only because his body of work is so consistently original and interesting. It is because what he represents in the anime community is rare and appears to be fading: a commitment to making artistic but not inaccessible anime film (not TV, Paranoia Agent excepted), works with social significance that bear an individual stamp. He was, in short, one of anime’s few auteurs, and in a time when anime seems to be turning in on itself, such outward vision needs a champion. Someone who, by skewing our perspectives just a bit, gives us a glimpse of another world and helps us see things with new eyes rather than just confirming our prejudices once more. Someday that person will arrive. Art never dies. But he or she will not be the same, which is good. Art also always progresses and moves forward. But it will not be Kon. But damn it. I wanted to see one more of his movies. Just one more. Our own wintermuted wrote one in his blog, The Wandering Kaijyu. Jeremy posted our first news article about it just earlier today. Martin at Mono no Aware wrote a lovely review of his work, which helped inspire this one. I agree with Subatomic Brainfreeze: the loss of Kon has not come at a good time for the anime industry. Here’s to hoping someone will carry the torch of artistic anime. Perfect Blue was one of the first full-length anime movies I ever saw (preceded only by Akira, I believe), and it totally opened my eyes to the serious possibilities of the medium. I suppose, in a sense, Kon’s works are somewhat all alike because he always focused on the blurring of reality and perception; a perfect use of anime. You do need to see Paranoia Agent, though. I heard it was a dumping ground for all the ideas he had that were too whacked out to make it in previous works, so it’s even trippier and stranger than usual for him, if that’s even possible. But very good. Nicely said Mike. Wonderful article. Thanks, everyone. I’ll be checking out Paranoia Agent on Netflix sometime. My roommate also has a book-length analysis/study of Kon called “Satoshi Kon: The Illusionist” which I also plan to read.